Serco’s full line of LoadWarrior™ hydraulic, air and mechanical lift tables, turntables and tilters reduce back-related injuries while increasing overall productivity by making products and materials more accessible to the workforce. Serco LoadWarrior™ in-plant products automate simple tasks. Serco LoadWarrior™ Turntables allow workers to rotate their work to them, rather than walking around it. 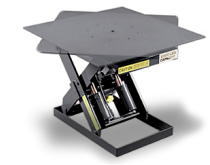 When used with a Serco LoadWarrior™ Scissors Lift Table, LoadWarrior™ Turntables reduce reaching, bending, twisting and walking associated with palletizing operations, easily enhancing both ergonomic and labor-saving benefits. Manual or powered models are available to efficiently palletize, build-up and break-down. Can be mounted on scissors lift, stable bench, or other surface.